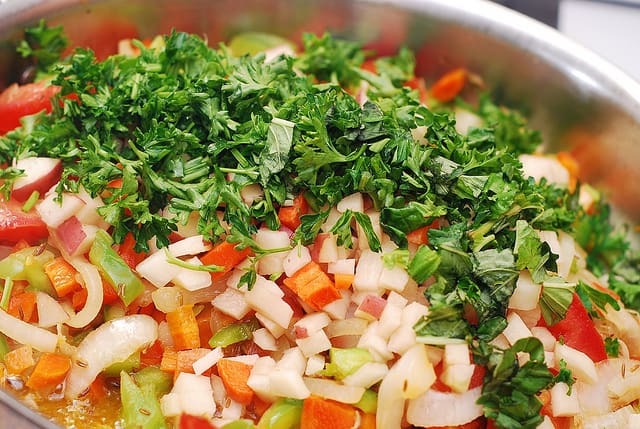 Lagman is a One-Pot Lamb and Vegetable Noodle Stew. 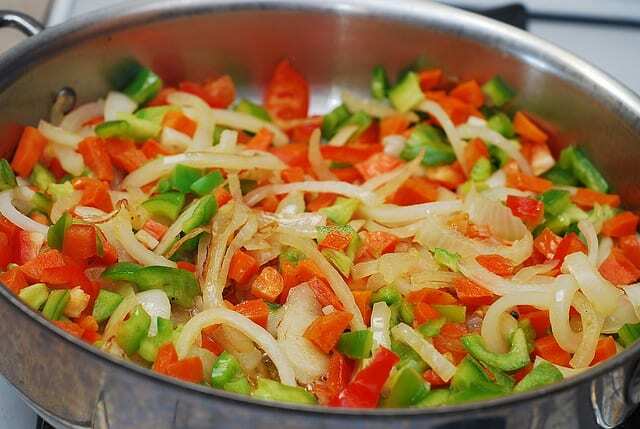 This traditional Central Asian dish is made with lots of vegetables: onion, carrots, bell peppers, tomatoes, potatoes, garlic. There are lots of flavors and spices in this Uzbek noodle dish: cumin seed, fresh parsley, fresh basil. Everything is cooked in one pan. Minimal clean-up! 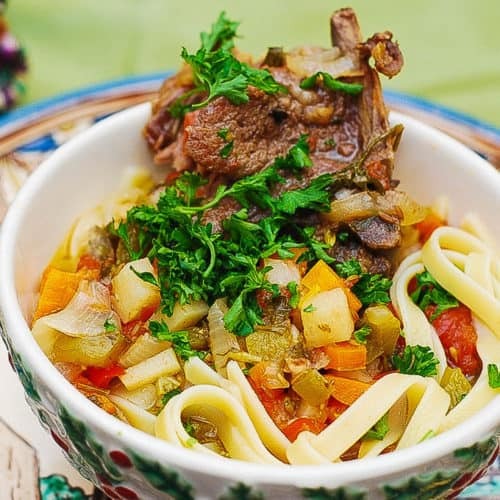 Lamb vegetable noodle stew, called Lagman, is a popular comfort food in Central Asian countries. This stew has Chinese origins and has a long history of being a staple of oriental cuisines from the Great Silk Road. Savory and delicious, lagman can be served as a stew, soup, or pasta dish. It all depends how you wish to serve it. 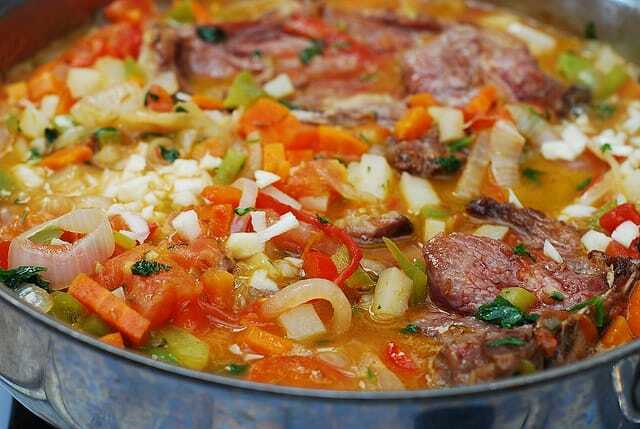 I love lamb, and the below recipe is one of the simplest (and cheapest!) ways to cook lamb. I will be using lamb shoulder chops, which are affordable and can be found in most stores. 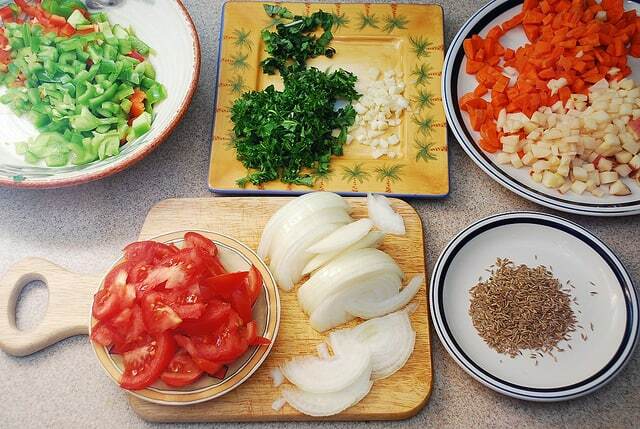 Below are step-by-step photos to show how to make lagman. For complete recipe, scroll down. 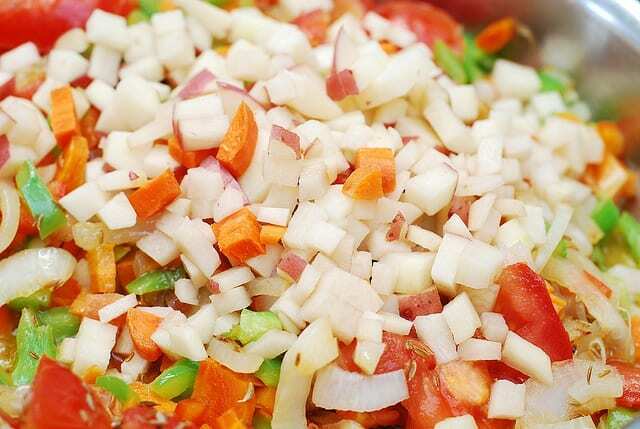 1) Finely chop all vegetables: Cut onion in half and then slice thin rings. 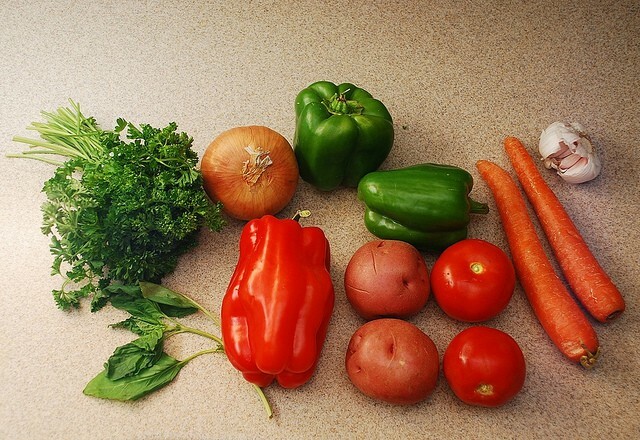 Chop carrots, bell peppers, potatoes in small-medium cubes. Slice tomatoes finely. Finely chop parsley and basil. Chop garlic cloves. 2) Pour olive oil in a large pan and heat it on high heat until hot. 3) Add lamb chops and cook on each side until nicely browned – about 7 minutes on each side. 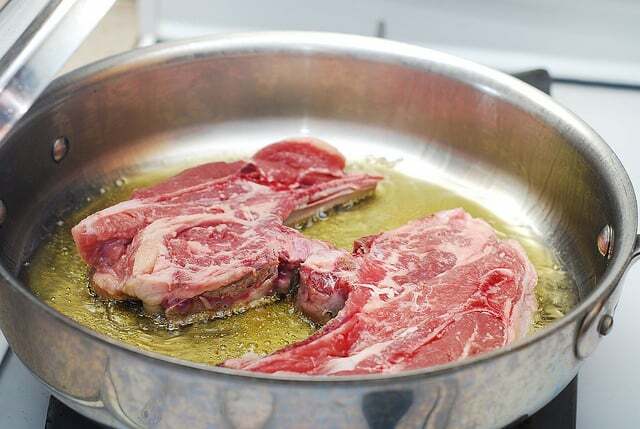 4) If lamb chops start sticking to the pan, just leave them there to cook until they do not stick any more and then you can flip them over to the other side – when pan gets hot enough it will be easy to flip them over. 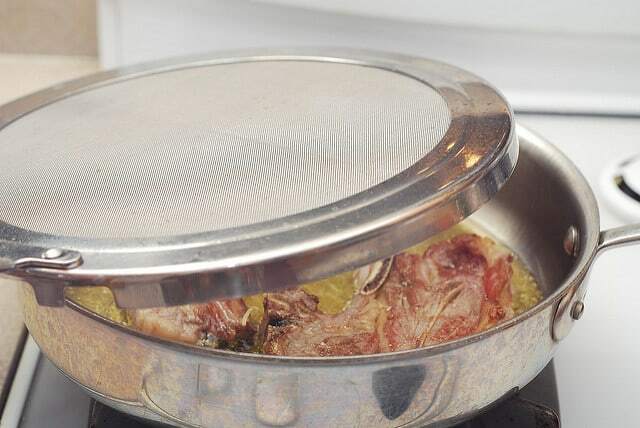 5) Do not cover with lid – use splatter screen instead. Splatter screen lets the steam out and prevents olive oil from spraying out of the pan. It’s a very handy tool! 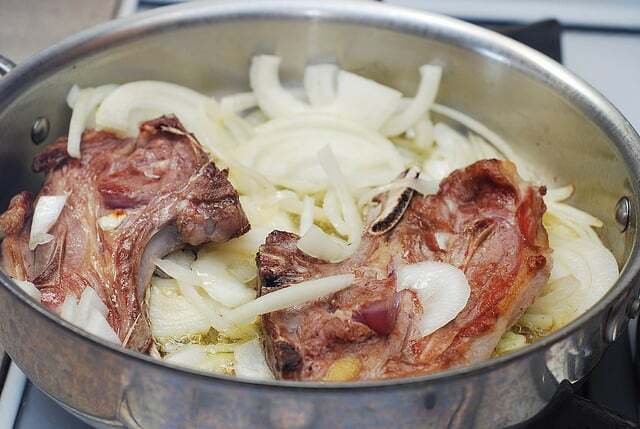 7) First, add onions to lamb chops and continue cooking on high heat. Cook for about 5 minutes, until onions get a little browned. 8) Add carrots and continue cooking and stirring on high heat, uncovered, or using splatter screen. Cook for about 10 minutes, then add bell peppers. 9) At this point, remove lamb chops to a separate plate and continue cooking vegetables uncovered on high heat for 5 minutes. 10) Add tomatoes, cumin seed to the pan. Continue cooking for 10-15 minutes until tomatoes are cooked. 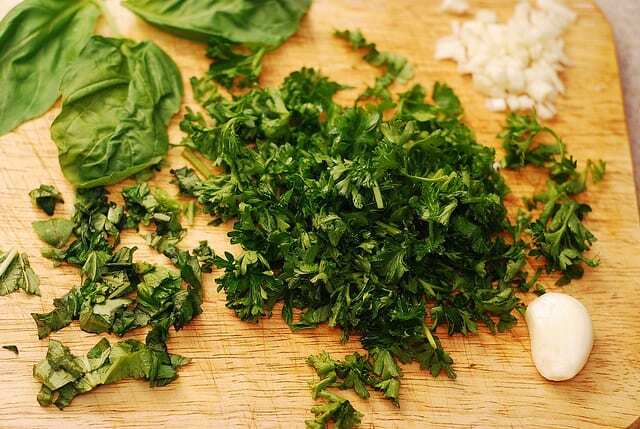 11) Finally add potatoes, half of chopped parsley and basil, salt to taste – mix everything up, cook for 5 minutes. 12) Add 2.5 cups of water, when it starts boiling, throw the garlic in. 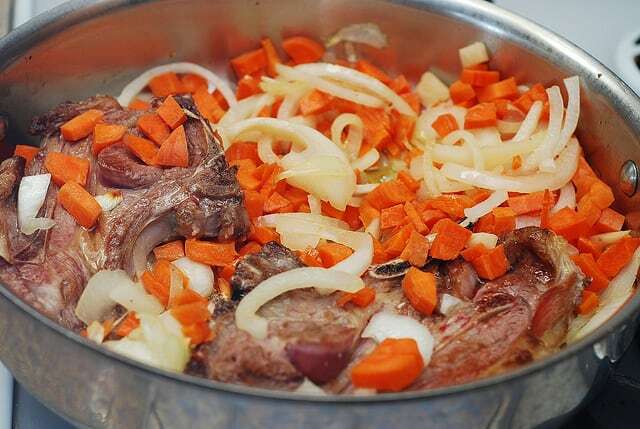 13) Return lamb chops back to the pan, settle them at the bottom of the pan, with the vegetables around or a bit on top of lamb chops, bring to boil. 14) Reduce heat to low, but so that the liquid continues simmering in the pan. On my stove when the dish has been heated through like that, low setting still results in pretty strong simmering, but on a different stoves, the low setting might be too low for simmering. 16) Cover with the lid and let it simmer for 30 minutes. 17) In the mean time, boil water for pasta, throw the pasta and cook it until al dente. Drain pasta. 2) Add noodles in each bowl. 3) Pour the stew with vegetables over the noodles. 4) Top with a lamb chop. 5) Sprinkle with chopped greens (parsley and basil) on top. 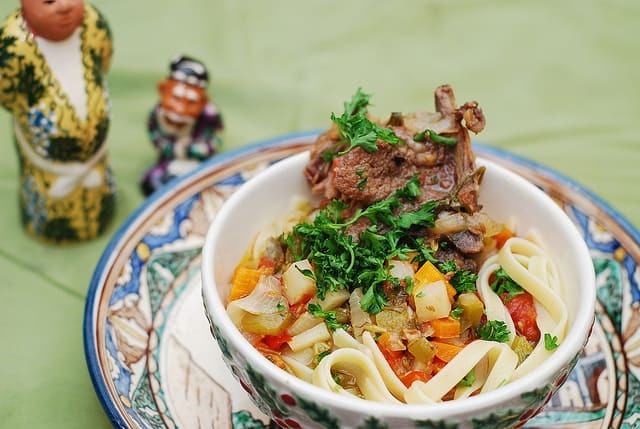 Lagman Recipe – One-Pot Lamb and Vegetable Noodle Stew. 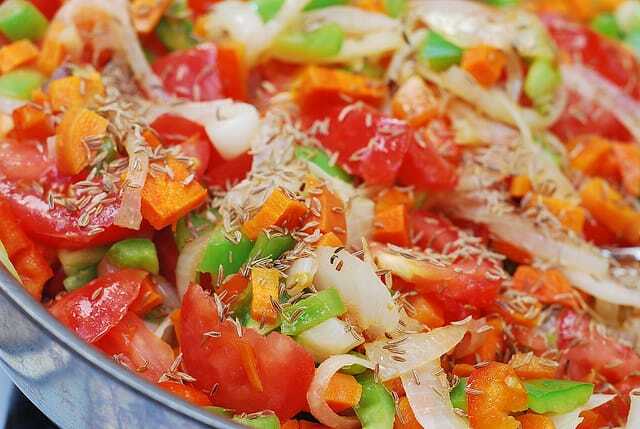 This classic Central Asian dish is made with lots of vegetables: onion, carrots, bell peppers, tomatoes, potatoes, garlic. Lots of flavors and spices: cumin seed, fresh parsley, fresh basil. It's a traditional Uzbek recipe. Everything is cooked in one pan. Minimal clean-up! 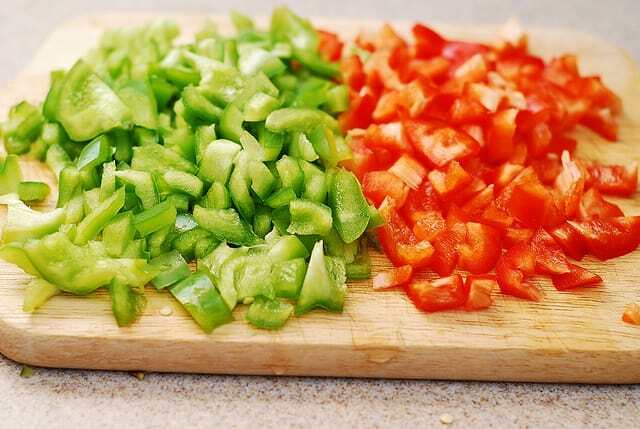 Finely chop all vegetables: Cut onion in half and then slice thin rings. 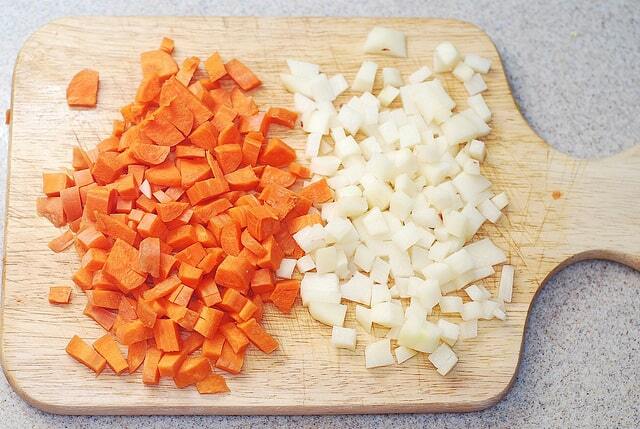 Chop carrots, bell peppers, potatoes in small-medium cubes. Slice tomatoes finely. Finely chop parsley and basil. Chop garlic cloves. Pour olive oil in a large pan and heat it on high heat until hot. Add lamb chops and cook on each side until nicely browned – about 7 minutes on each side. 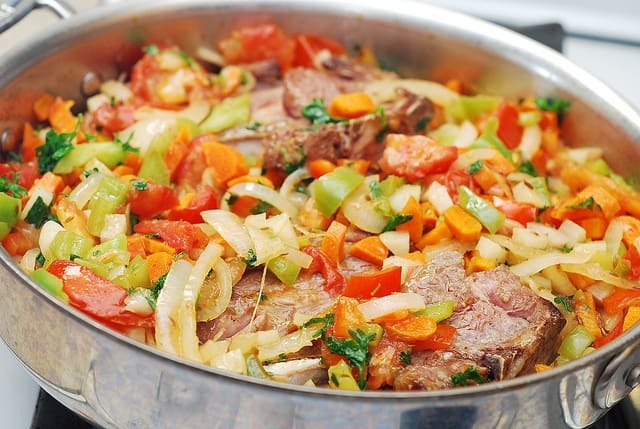 If lamb chops start sticking to the pan, just leave them there to cook until they do not stick any more and then you can flip them over to the other side – when pan gets hot enough it will be easy to flip them over. 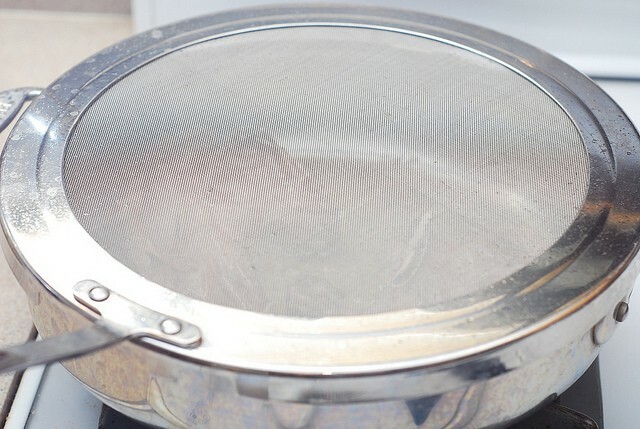 Do not cover with lid – use splatter screen instead. Splatter screen lets the steam out and prevents olive oil from spraying out of the pan. It’s a very handy tool! First, add onions to lamb chops and continue cooking on high heat. Cook for about 5 minutes, until onions get a little browned. Add carrots and continue cooking and stirring on high heat, uncovered, or using splatter screen. Cook for about 10 minutes. Then add bell peppers. At this point, remove lamb chops to a separate plate and continue cooking vegetables uncovered on high heat for 5 minutes. Add tomatoes, cumin seed to the pan. 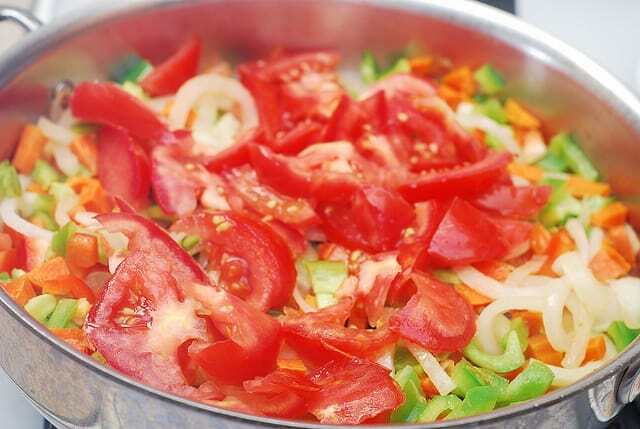 Continue cooking for 10-15 minutes until tomatoes are cooked. Finally add potatoes, half of chopped parsley and basil, salt to taste – mix everything up, cook for 5 minutes. Add 2.5 cups of water, when it starts boiling, throw the garlic in. Return lamb chops back to the pan, settle them at the bottom of the pan, with the vegetables around or a bit on top of lamb chops, bring to boil. Reduce heat to low, but so that the liquid continues simmering in the pan. On my stove when the dish has been heated through like that, low setting still results in pretty strong simmering, but on a different stoves, the low setting might be too low for simmering. Salt to taste. Cover with the lid and let it simmer for 30 minutes. In the mean time, boil water for pasta, throw the noodles and cook it until al dente. Drain pasta. Add equal amount of noodles in each bowl. Pour the vegetable stew over the noodles. Top with a lamb chop (slice lamb chops, if desired). Sprinkle with chopped greens (parsley and basil) on top. I may cook this for 20 guests, do you think I could prepare chunks or pieces of lamb, and not lamb shoulders? 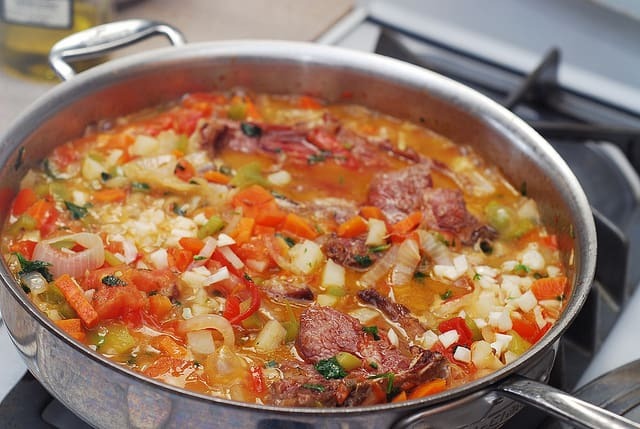 Would be more “Stew” like…let me know your thoughts? Oh my, this is beautiful!! And delicious, of course. 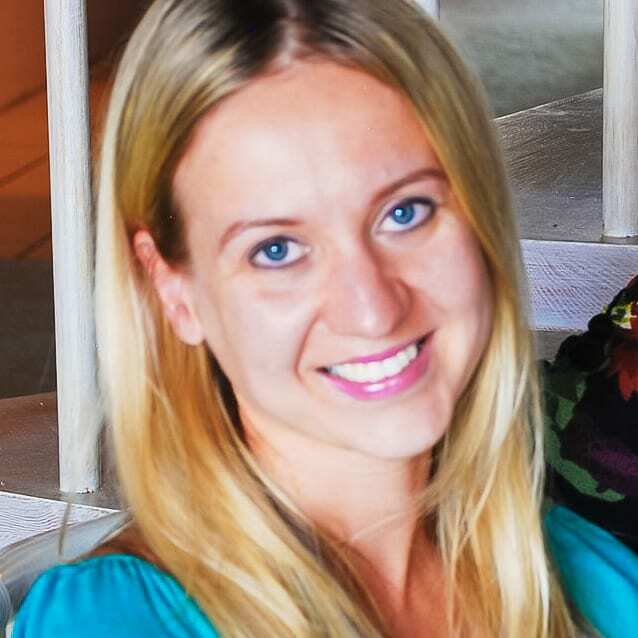 I also love your plate in the very first photo…so pretty. I really need one of those splatter screens! Looks delicious. Cab’t wait to try it and I can’t remember the last time I cooked lamb. Thank you! Yes, those splatter screens are great! This recipe is very doable! The only “challenging” part is chopping all vegetables, because it’s somewhat time consuming. Yes, I leave the oil in the pan after browning the lamb. All the juices absorbed by olive oil during browning and the flavor of olive oil itself add to the dish. The pasta actually SHOULD be quite long. 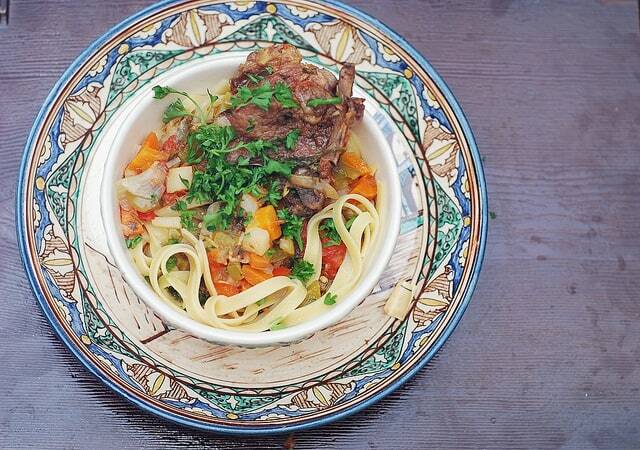 Traditionally, this dish is eaten with homemade pasta, which is made extremely long.